When treating hearing and balance disorders, a complete treatment period normally lasts for 9-13 continuous weeks with 2-3 treatment sessions per week, in total 20-25 treatment sessions. For patients suffering from sudden deafness there is at least 12 treatment sessions during the first 32 days and thereafter there could be an additional 13 treatment sessions during six weeks. Each treatment session lasts for about 35-40 minutes when hearing and balance disorders are treated. Patients being treated for hearing and balance disorders are normally lying down horisontally on a stretcher (which is the most simple way of treating most patients) or sitting (sometimes the easiest position for people sitting in a wheel chair). The treatment is painless, harmless, without any risk for damages or permanent side effects. Pulsed electromagnetic field therapy (rTMS/PEMF) is conducted with an applicator generating a maximum magnetic field of 100 microTesla. 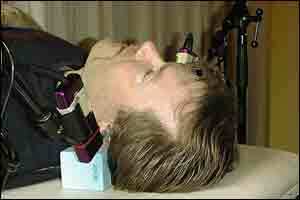 The therapeutic device used is a Bemer 3000. Laser therapy is conducted withdefocused semi conductor lasers of class 3A and 3B (GaAlInP, GaAlAs and GaAs) with the wavelengths 650, 808 and 904 nm. The maximum effect of the diodes is 15, 35, 50 and 490 mW. Laser therapy is conducted using the effects 15 mW, 35 mW and 15 - 490 mW. 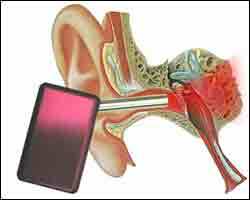 Both ears are always treated, also when only one ear is afflicted by hearing or balance disorders. There is nothing excluding other therpies at the same time as a patient is undergoing the treatment at the Audio Laser Clinic. Some patients are satisfied with the result after one treatment period. Some patients are coming back to the clinic for repeated therapy. Some patients buy their own laser therapy eqipment and a pulsed electromagnetic field device to conduct their own treatment at home. Each treatment session costs SEK 800. Before therapy can start examination must be carried through. Examination costs SEK 800.